Of course, this outfit NEEDED a hat of some kind. 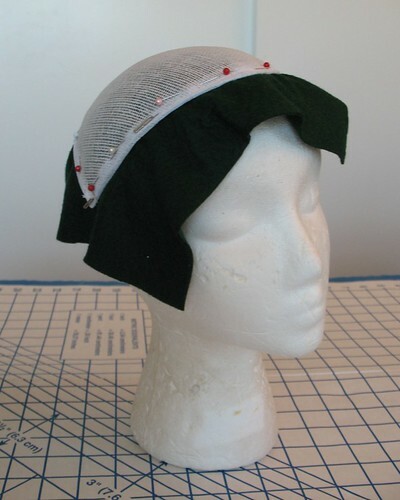 I knew I was going to want something that said "1950s," so I started with a buckram hat form from Britex since I am too lazy to make my own. 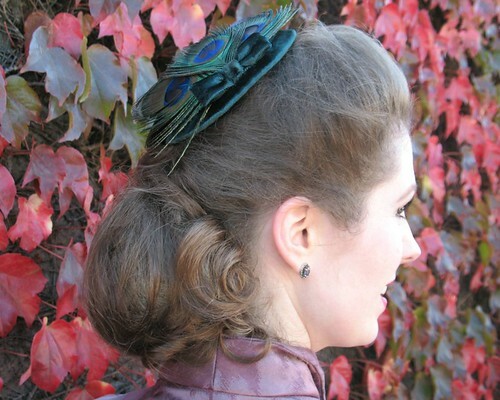 The form is meant to be worn with the point facing forward or back, but I wanted it on the side of the head. 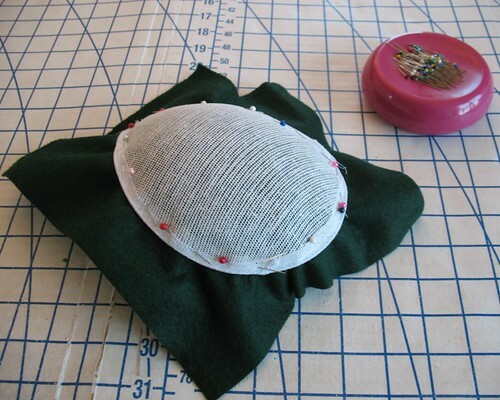 This made the form a bit too large, so I pinned it to a styrofoam wig head I have using t-pins, and carefully steamed it. Thankfully, the buckram did not stick to the styrofoam! 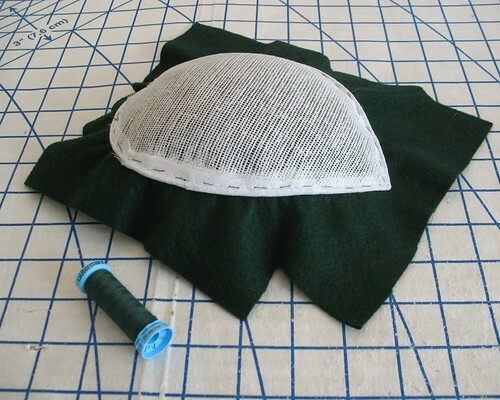 My hair is rather slick, so I like to use felt on the interior of a hat instead of silky lining material (I find that it is also much easier to add elastic holders to a thicker fabric like felt). 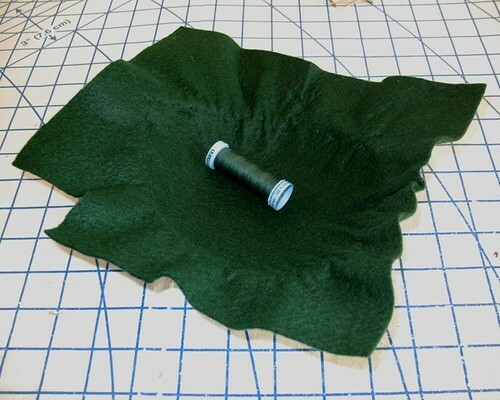 A square of felt was cut out and pinned to the inside of the form. To help the felt adjust to the concave surface, I pinned it back on the wig form and gave it a good steam. After letting everything cool, the form was removed from the head and hand basted along the edges. 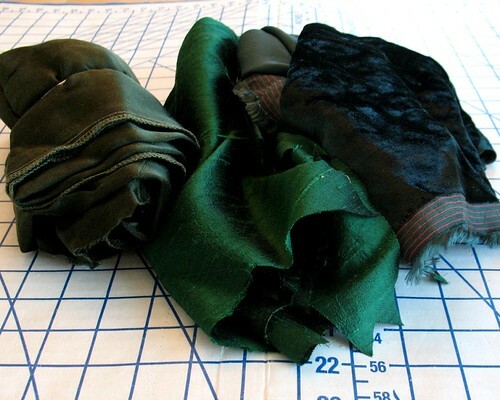 There were a few options for fabric, but in the end, the velvet I found tucked away in a drawer seemed like the best match. As I have mentioned before, I am not a fan of glue for apparel and accessory projects. 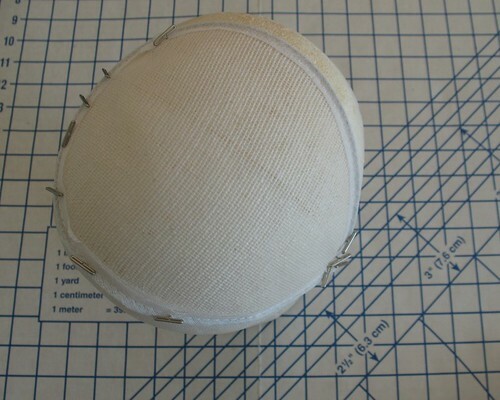 Sometimes it cannot be avoided, but whenever possible, I stick with my needle and thread. The feathers were a bit of a bother to deal with. 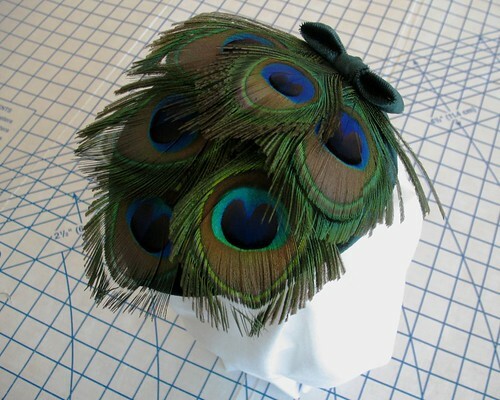 I found that the best way of attaching them was to hold the hat up-side-down so the thread would not tangle and “unzip” all of the peacock feathers. 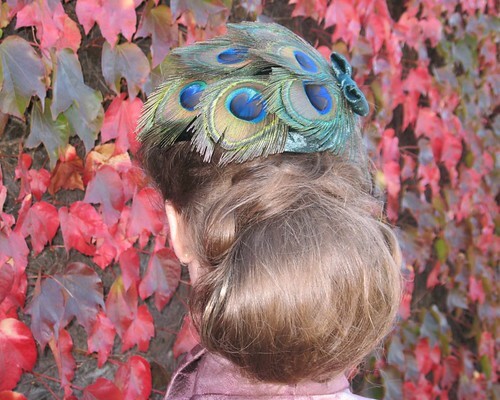 Once they were applied, the feathers were sticking up and not following the curve of the hat. I had a bit of a panic, and then decided to throw a piece of muslin over the entire thing and steam the feathers. It worked! 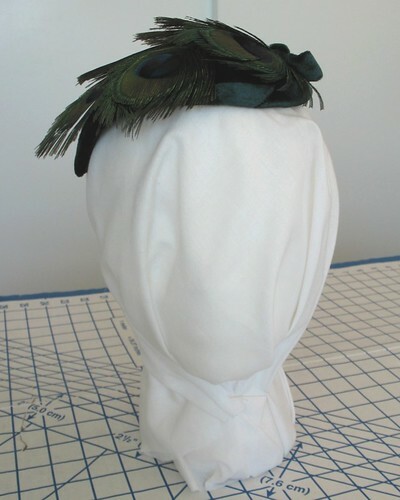 They still have enough loft that creates a fun and feathery texture, but they also fit the shape of the hat much better! 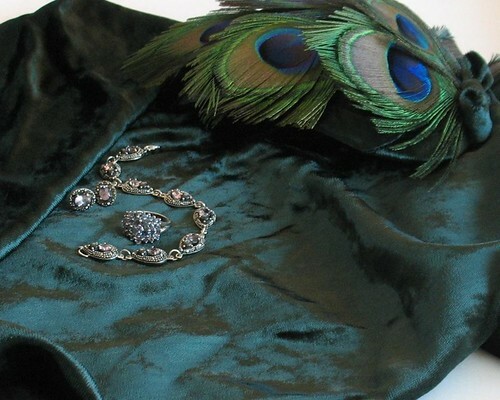 I was originally going to add beads to disguise the ends of the feathers, however, I had reached my beading limit! Instead, I used the leftover bias velvet pieces to make a little bow. One of the white ends of the feather was peaking out when viewed from certain angles, so I used a green colored Sharpie pen to dab the white away. 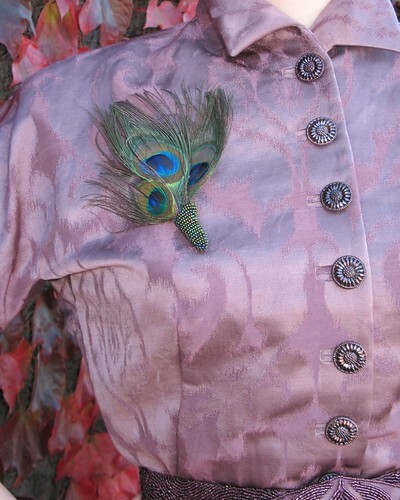 And, of course, it matches back to my brooch! 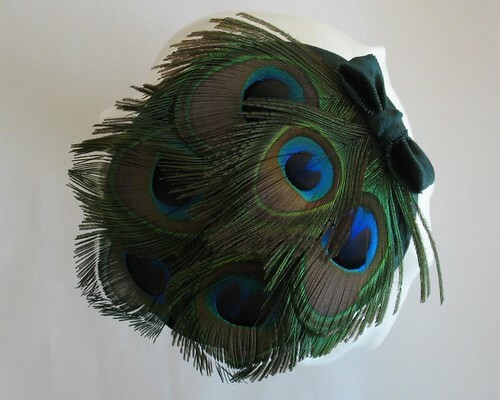 There are still quite a few peacock feathers left, so I may have to come up with another feathered project at some point! Very nicely done :) It's gorgeous! It is so nice!!! Love your blog. Sorry, my english is not so good. Lining the hat with felt to stop it slipping, what an excellent idea! And your fasinator is so pretty. For the first time ever last week I used a hot glue gun to assist in the anchoring of flowers to a fasinator that I needed to make in a hurry. I felt as though I cheated a bit, even though no-one knew, you couldn't tell anyway, and most RTW hats are all glued. Beautiful! I love that little green bow! And thank you so much for the work-in-progress-photos with the buckram, still something I desperately want to try myself. Thank you! 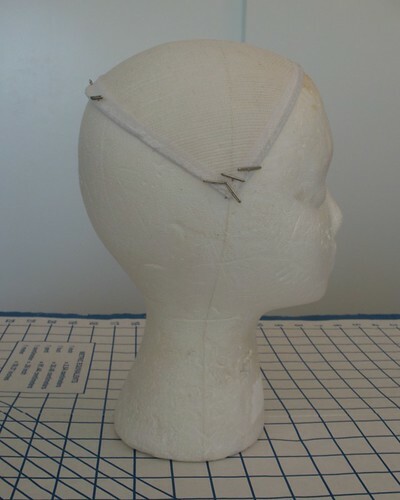 I wish I knew more about the art of millinery, but it would mean purchasing quite a few more pricey items for the sewing room that I am not quite prepared for . . . someday! 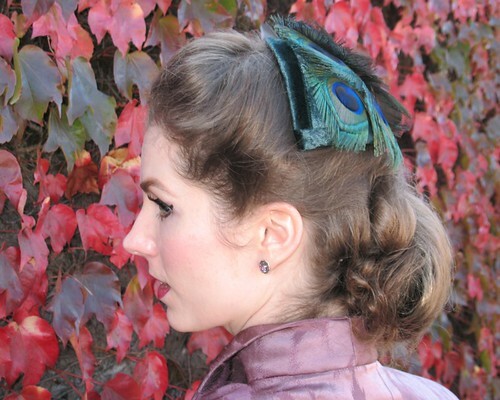 It may be that I have peacock feathers on the brain, but I have been noticing quite a few of them in the fashion world these days. Hopefully they are making a comeback! A Happy Belated Halloween to You!